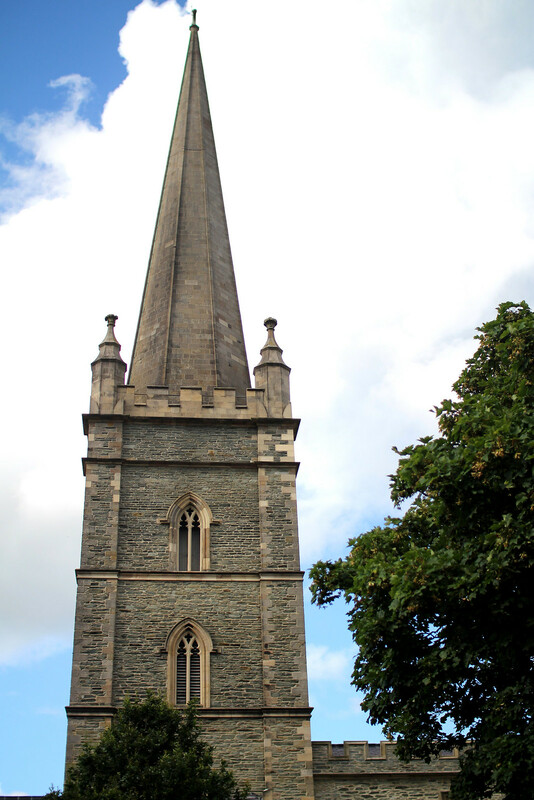 After leaving the beautiful grounds of Castle Leslie from the night before, the first major stop on our Northern Ireland road trip was Londonderry. I’ve always been a bit conflicted over what to call it, having friends from there calling it Derry both for short name purposes, and belief it should be part of the republic of Ireland. Along the drive it became obvious there are still heightened issues today over the name, with road signs having the word ‘London’ crossed out, and visa versa. Although we didn’t feel unsafe in Londonderry, a part of me can’t deny the slight unease over tensions still prevalent today. There is currently no threat of violence in Londonderry, and I must stress that. You are more than welcome and safe to visit there, but like any place - be aware of your surroundings. We were advised not to loiter in areas marked by flags at night-time, either by unionists or nationalists. You’ll find most of the murals in these areas, but I would advise away from wearing any Union Jack style items of clothing. 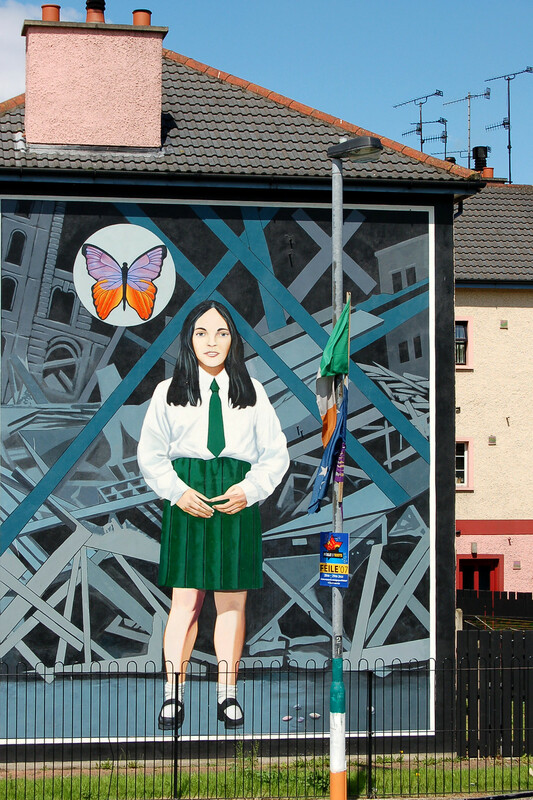 The murals in both Londonderry and Belfast are fascinating. 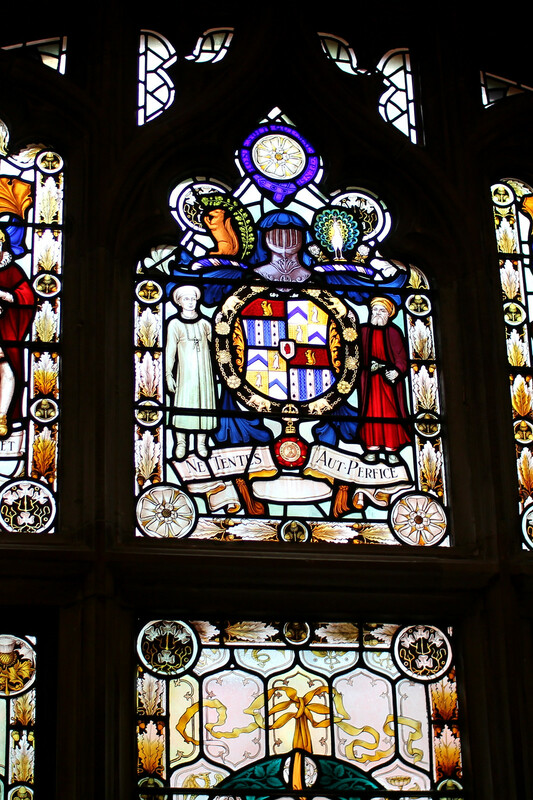 Both created out of the same issues over belonging to the United Kingdom or the Republic of Ireland. There’s so much history of recent times I didn’t fully understand, and it’s a great way to educate yourselves on both sides of the story. Whatever decision you side with, the murals are on a huge scale and utterly fascinating to see. 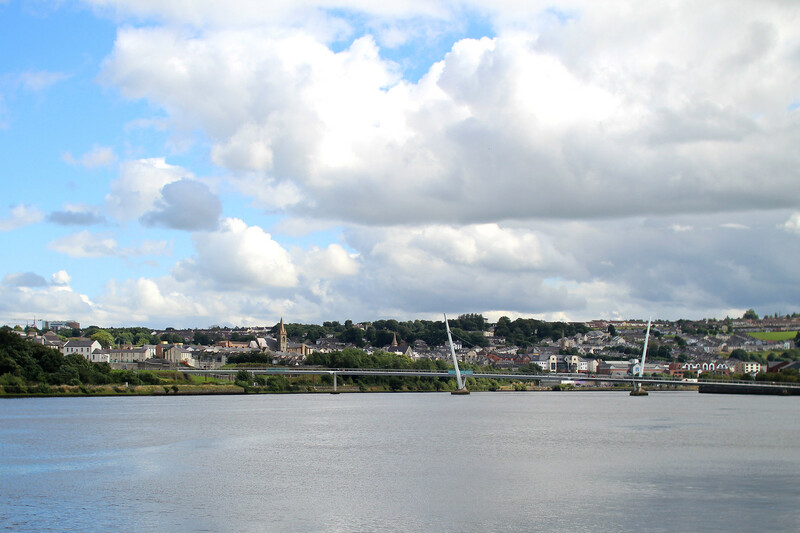 Connecting both sides of the city, the Peace Bridge gives great views across the surrounding areas and city centre. 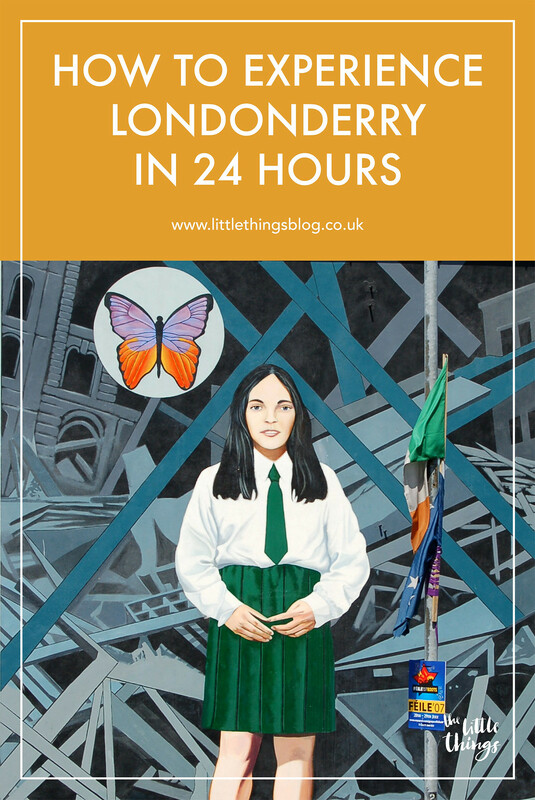 Londonderry is a relatively small place, so you can cover a lot in one day. Down by the bridge area you’ll also find some great bars and restaurants. There’s also several information board points along the way to highlight the next mural along the trail, should you be following it. 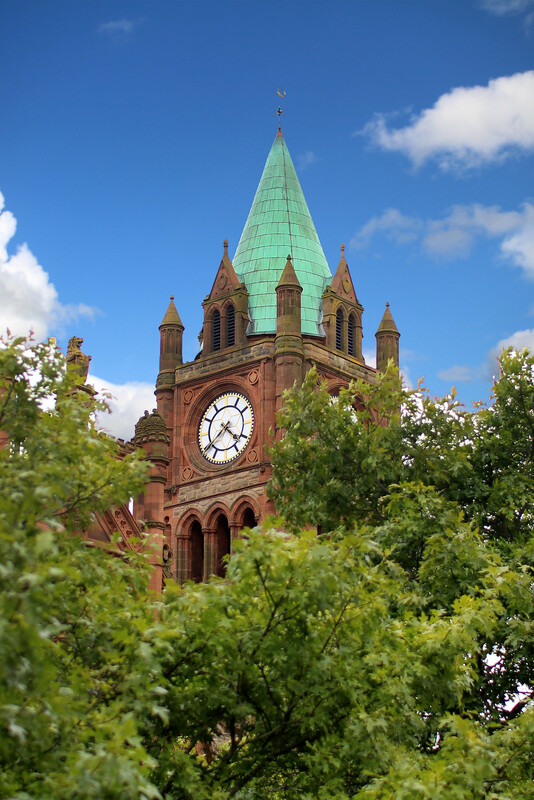 A beautiful old historic building in the centre of the city, something which looks more like a cathedral than a town hall. Take a seat for a while and watch the world go by through the fountains at the front, just be careful not to get wet! 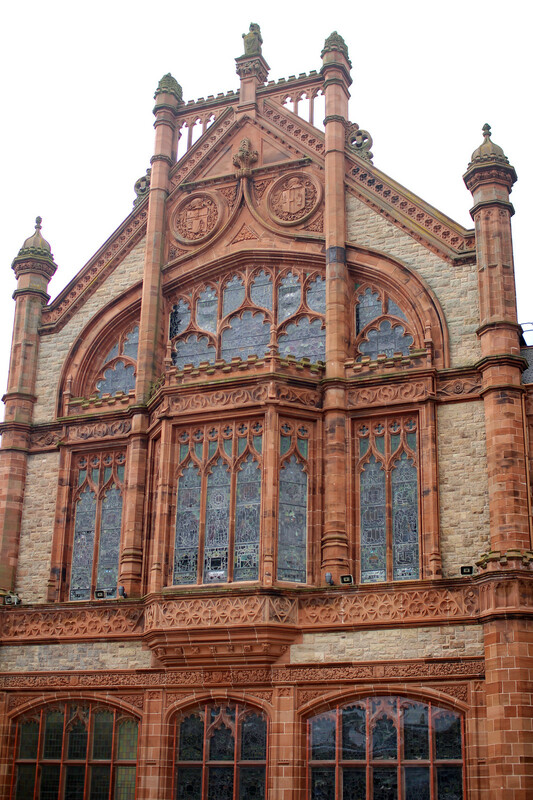 It’s free to enter and has some impressive stained glass windows inside, illustrating the story of Londonderry. Similar to York in England, Londonderry is a walled city, which walls still remain today. It doesn’t take too long to walk the entirety of the walls, and it gives a great all round view of different parts of the city. 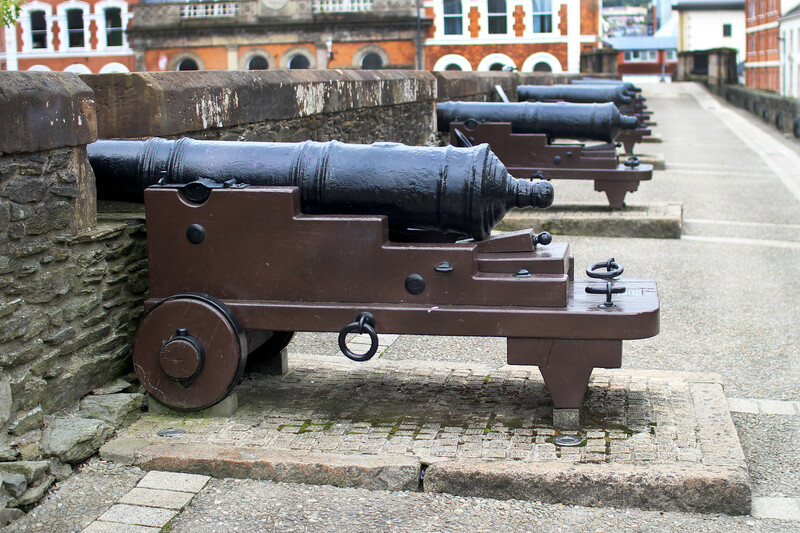 Here you’ll also find sets of cannons and other snippets of history. 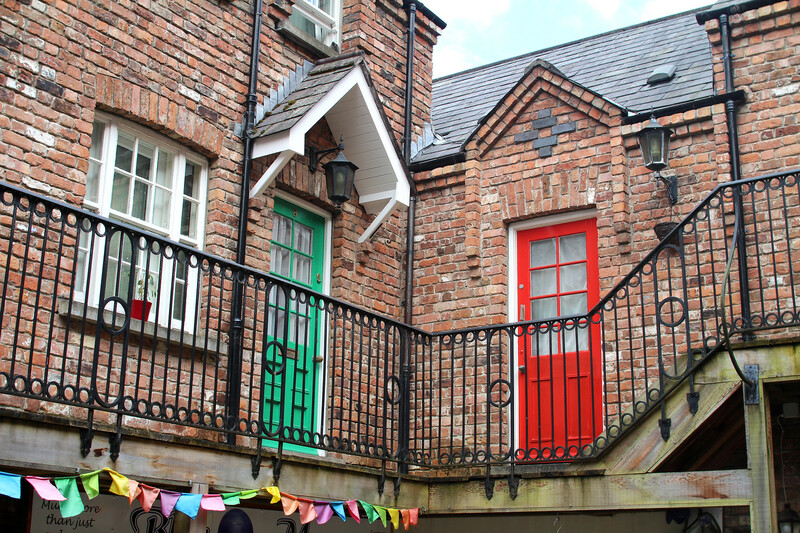 Although only small, the craft village is a little treasurer, with quaint gift shops and craft supplies. 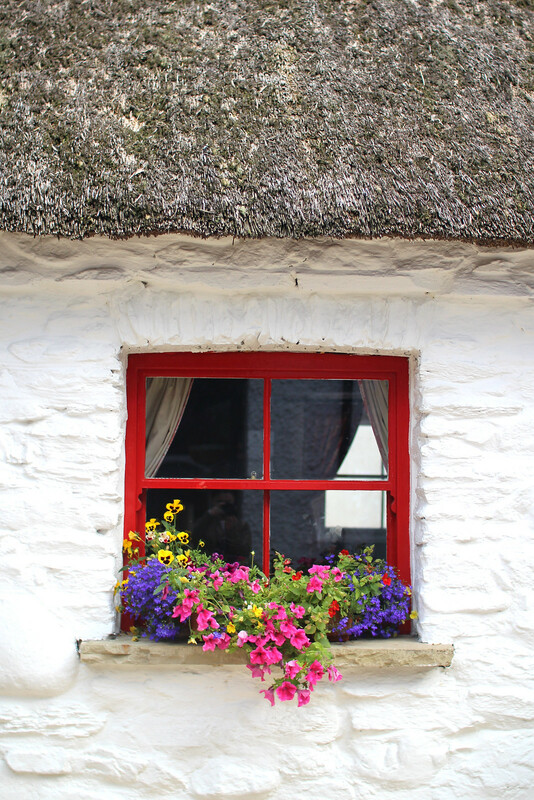 Home to a sweet thatched cottage and small colourful houses above shops. 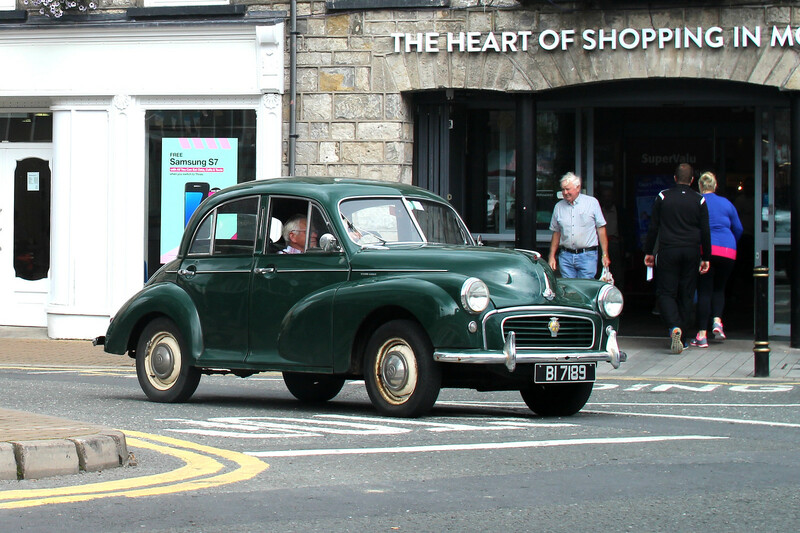 You’d be forgiven for believing you’ve stepped back in time. It’s here you’ll find all the best from local artists selling their wares. 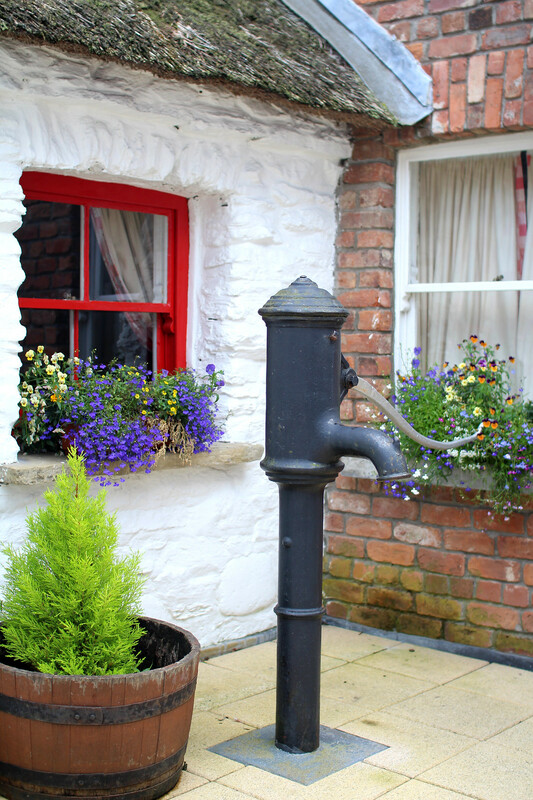 There are several museums you can enter in Londonderry, perfect for a rainy day. Most of them do charge a small admission fee, so be sure to ask before you proceed. Check out the Tower Museum for all things historical. 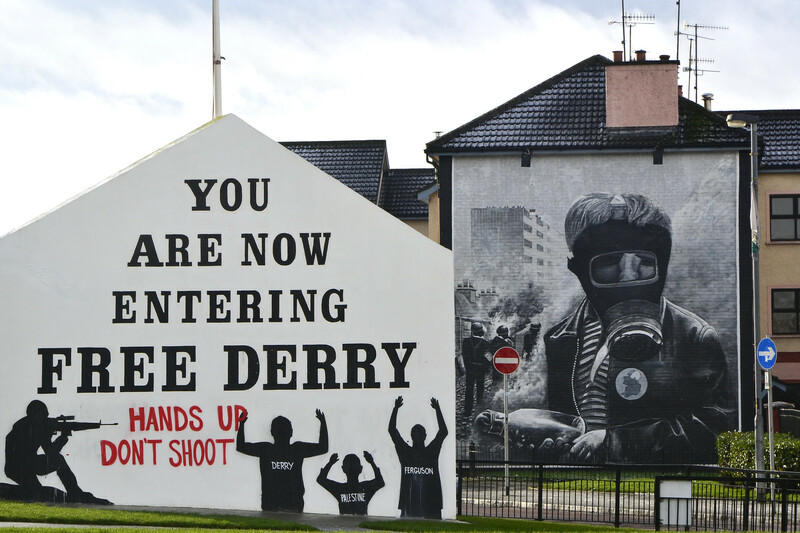 You’ll also find the Museum of Free Derry - especially useful for further information about the murals. 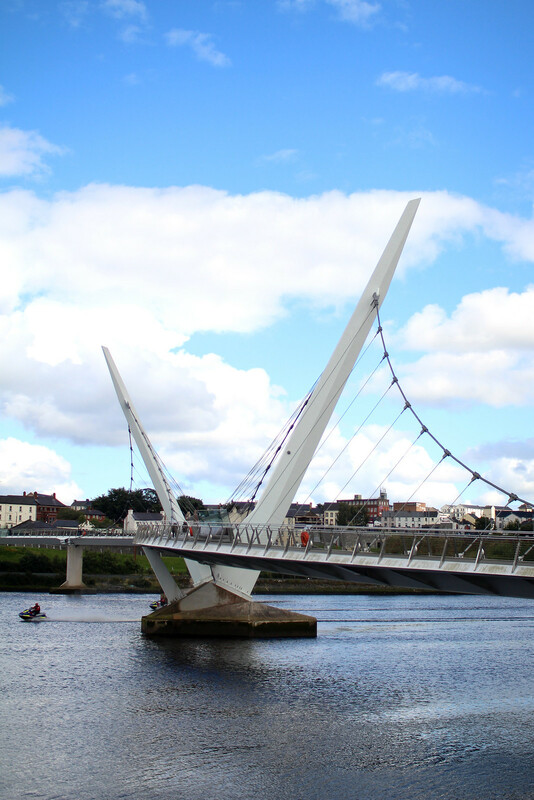 Are you planning on visiting Londonderry? I hope this guide helps to inspire your visit!